As the rain pours down with ever increasing force, we completed the purchase of our new car this weekend. The main attraction – the splendid glass roof, which given the right weather conditions will open to flood the car with light and air. Of course at the moment the only worry is that it will flood. So far so good, no sign of any incoming droplets, which is a very good thing. 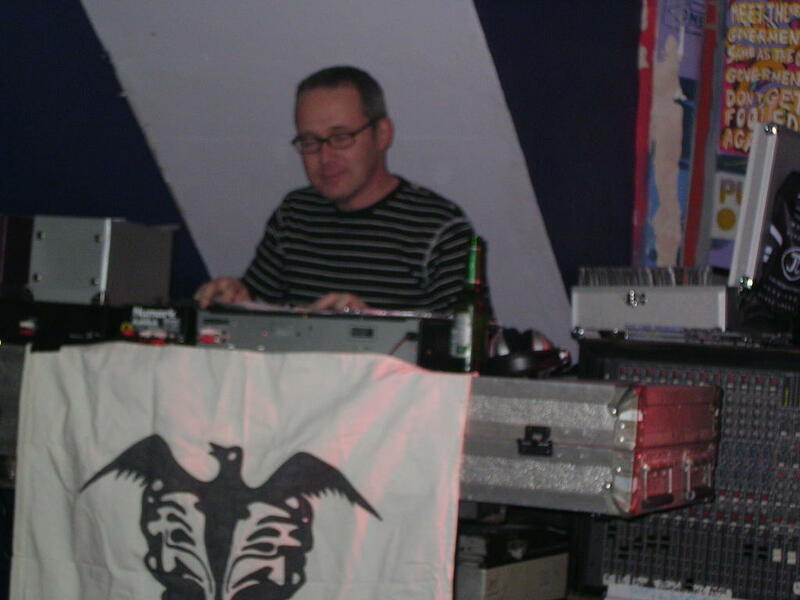 Since our recent holidays we’ve been rather lacking in gigs to attend, however we managed to get ourselves along to The Cube last Thursday, to see SJ Esau’s John Peel anniversary night. We went along with a few friends who were making their first visit to this wonderful place. It was a typically chaotic and noisy night featuring all manner of mayhem. Whilst listening to radio 6 this morning I rediscovered a lost treat – The sublime “Katy Song” by Red House Painters. They were someone that I only discovered long after they had split up. Finding them was one of the many benefits in fact of working at Imperial. Beren who worked there with me was a huge fan and pointed me in the direction the excellent double CD compilation of their work on 4AD, it’s a fine thing. Well a bit of a first for me last night. On Friday I was asked if I would DJ at the latest evening of musical delights from the Grumpy Man collective? Thought I may as well give it a go, have to say that I really enjoyed it. People even came up to me to ask what some of the records were, just like a proper DJ. It was all done with CD’s, so in reality it’s pretty straight forward, and given the nature of the evening, there is no pressure to keep people dancing – what can go wrong? Anyway here is my set list. Found out today that a couple of our best friends are leaving the area. After a lot of thinking they have decided to head up to Scotland. It’s got me thinking about our situation, I’ve never lived anywhere other than Bristol, and the same is virtually true for Orynthia. She has lived here for as long as she can remember. Now this brings many advantages, we’ve lead pretty sociable lives, so whenever we go out in Bristol it’s pretty likely that we are going to bump into a friendly face or two. It’s also true that Bristol is a great place to live, lots to see and do, good travel connections and generally a nice relaxed atmosphere. And yet… I did feel a little pang of envy. I love the idea of the bold new adventure, heading off to a place where you have no obvious links with anyone or anything. Just the two of them together, working out how things in that community work, how to fit in with the people around you, where to buy your bread, the best way to get from A to B or even C.
Then again our friends have both moved around England during the course of their working lives, so I guess they are well prepared for the challenges ahead. We’ve always been steady, organised, no risk sort of people. That makes us sound dull, it’s not meant too, because I think we’ve had a fantastic life. Seeing and doing so many different things. As I write this the wonderfully simple song by Smog called “Let’s move to the country” has just come on the CD player. Now you could never call Orynthia and I country folk, but it really suits our friends. As the song says, “ Let’s move to the country, just you and me. My travels are over, my travels are through.” I don’t know if their travels are through, but they might well be. Then again if you are used to relocating every few years can you ever completely settle in an area or does the urge to reinvent yourself come along every few years? It’s been a busy few days, stating last Thursday with a visit to The Prom, a John Peel day gig featuring our favourite faux country band – Wilma. I’m sure we weren’t the only people to hear a cover version of Teenage Kicks that night, but the boys carried it off with some style. On Friday we nipped out to see the latest work of genius to come from Bristol – Wallace & Gromit: The Curse of the Were-Rabbit. Funny. Knowing and great to look at we all loved it. Saturday saw Bristol City continue to limp towards the middle of the table with a hard fought 1-0 over Tranmere. The football theme continued on Sunday when the plucky Bryan Munich went out of the cup at the first attempt, yet we played really well and were more than a tad unlucky. Oh well now we can concentrate on the league. Sunday Evening saw making the short trip to Cardiff to see the majestic Roddy Frame. You can see a million people standing up with a guitar and singing a self penned song, yet when someone like Roddy does it a sort of magic take place. He was on top form and the crowd of middle-aged fans lapping up every note. Back home after our short trip to Scotland. We had a fine time, Falkirk was fun, and Glasgow was grand. 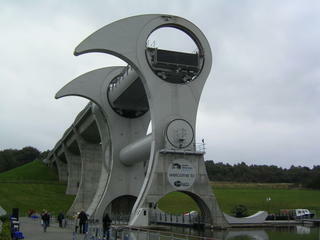 The Falkirk Wheel is quite a thing, if you like concrete, modern sculpture or engineering, you should pay it a visit. We stayed in an amazing B&B, it was within walking distance of the Town Hall, yet had the feel of a huge house in the country. Amazing garden, leading to plenty of bird watching activity over the breakfast delights. The gigs were good. On the 1sst night Aberfeldy opened up with a collection of little pop gems. Next up were The Pearlfishers, who I enjoyed rather more than Orynthia did. Lush piano driven singer songwriter stuff from another age, think Jimmy Webb or Burt Bacharach, not at all rock “n” roll, I like d the ambition of it. Finally The Trash Can Sinatras took to the stage and played a lovely set of songs old and new. The next evening saw us enjoying Malcolm Middleton (of Arab Strap) rather more than we expected to, have to say he dealt very well with some hilarious banter from a very exuberant female member of the audience. Then we enjoyed a majestic set from the mighty Teenage Fanclub. The lads were on top form, and it was great to see them in front of a Scottish audience, who sang along with gusto to many of the songs. The next day we took the short train journey to Glasgow, a city festooned with men in kilts in a high state of expectation before the Scotland – Belarus football match. Sadly their enthusiasm was misplaced as Belarus managed to secure a 1-0 win. We missed the football as we were enjoying our iPod tour of the musical highlights of the city. A lot of it was familiar to us, places such as the “School of Art”, “King Tut’s” and the splendid “13th Note”. New to us was the esoteric “Tchai Ovna” a very special café dedicated to tea form around the world and absolutely flippin’ marvellous “Mono”. Mono is a great place, part fantastic records shop (opened with help of many luminaries of the Glasgow music scene), part organic café, part super relaxed bar and also a live venue. I must admit that we spent ages in here on Sunday afternoon to rest our feet after the long walk of Saturday. It’s the perfect place to sit and read, and pick up some top tunes. Other than that we enjoyed another visit to The Lighthouse, always an interesting place the highlight this time was the Marimekko exhibition.